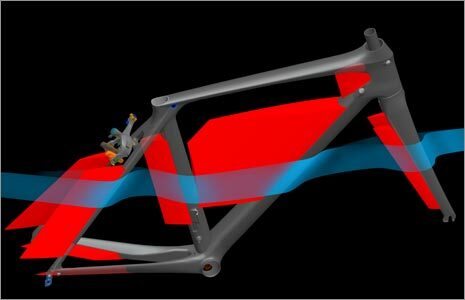 While most makers of carbon bike fames have been building super-light and super-stiff frame sets in recent years, not many have taken up the challenge to create a road frame that is also more aerodynamic. Scott’s FOIL was one of the first to combine all three. And Fitzgerald’s has them on sale for $2700. 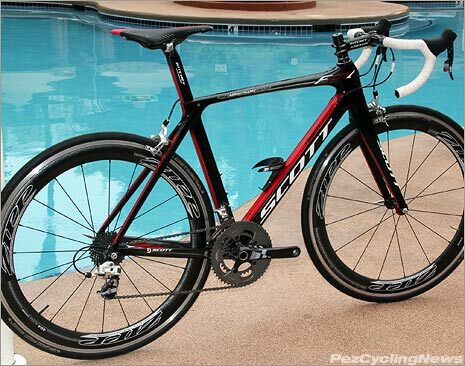 Check out the Scott Bikes online. By now you’ve seen these in the pro peloton, first under the Team Highroad riders (including Mark Cavendish who helped in the design process, and now under the Orica-Greenedge riders), and likely read a review or two. 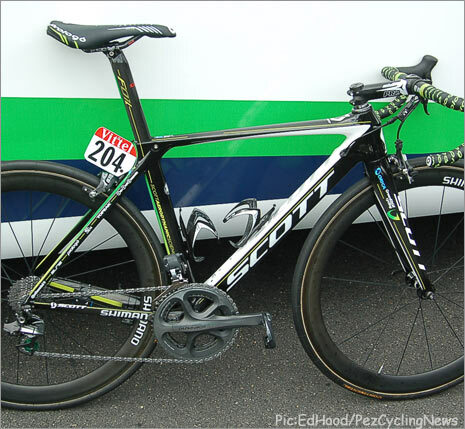 And while the frameset design itself has been extended across a variety of price points by Scott, the growing number of “aero” road frames from other manufacturers only adds credibility to what Scott was doing two years ago, when they launched the FOIL as an aero shaped road frame that was both very light, and very stiff. We talked at length with Scott’s chief engineer on the FOIL, Cyril Beualieu, who told us: “We tried to find a new concept to improve aerodynamics without using a complete aero profile, which is very bad for stiffness and weight.” Although the straight length tubes may look conventionally shaped to the casual observer, this tube set is anything but. Cyril designed specific curvature of the edges to optimize air flow around the tubes and also direct it to specific points around the bike. Building all three of these criteria into one frameset is anything but easy: there are plenty of light and stiff bikes, but these two parameters usually come at the expense of an aero shape. Giving up material to lose weight means you have less material to shape into anything ‘aero’, while shaping the tubes to counteract wind drag generally costs ‘stiffness’ at key places in the frame. Conversely, making the bike aero usually requires more material, which adds weight, or if done to keep the weight down, you end up with tubes so small they’re anything but stiff. The FOIL’s 840 gram frame is made from Scott’s proprietary HMX carbon – which they dubbed “high modulous extreme”. It starts with carbon strands made to their own spec, designed with a very high tensile strength (they use a stiffer fiber so fewer strands are needed to achieve their desired tube stiffness) that results in a lower weight in the final product. An HMX frame can weight up to 100 grams less than a similarly sized FOIL frame made with their next best grade HMS carbon. Like many of the top builders, Scott has developed its own process for forming carbon frame sections, and indeed whole frame sets. Scott’s integrated molding process (IMP) is their version of forming the tube sections under variables of heat and pressure to create very light, very strong, and very well shaped pieces that form the bike frame. Cutaways of the frame reveal that the tube walls are a lot thinner than I expected, especially given the relative large diameter of the main tubes. Bottom line is that they started out with a lighter material, then used some smart shaping so that less material was needed for the overall frame. The higher tensile strength of the fibers and overall tubes, combined with tube shapes that are anything but round, resulted in a frameset that comes in light, and is so stiff that the HTC boys actually asked Scott to dial back the stiffness on prototypes. Ride quality is determined with a combination of their carbon choices, and how they choose to lay up the carbon sheets. Since they know the flexion of each fibre and in which directions they flex, so they can control the stiffness at any point on the frame. So the weight and stiffness issues were covered – but what about making the whole package more aero? Remember that a couple years back, many manufacturers were delivering TT bikes that the UCI deemed “too aero” for a bicycle. The UCI announced its version of what was legal, and the manufacturers were invited to work within these parameters – if they wanted the all powerful “UCI Approved” decal that would make their bikes race legal. Scott got on board immediately to work within the guidelines. The engineering challenge was to take tubes with relatively small surface areas, and shape them practically for use on a road bike to direct airflow the way they wanted. When looking at any aero-designed bike, it’s important to remember that real-world wind direction is anything but constant. Unless you’re moving in a straight line, riding with no wind at all, you’ll be subjected to wind angles that swirl from many directions, and these will impact how efficiently the bike & rider will move through the wind. So tubesets and frame designs need to consider wind resistance from various yaw angles to truly paint a more complete picture. Although the straight length tubes may look conventionally shaped to the casual observer, this tube set is anything but. Cyril designed specific curvature of the edges to optimize air flow around the tubes and also direct it to specific points around the bike. The basic tube shape was applied to virtually every tube on the bike – head-, down-, seat-tubes and seat- and chain-stays too. Close inspection of each of these tubes shows the leading edge is wedge shaped while the back edge is almost squared off. Of course it helps that Scott has painted these flat sections on the back of each tube red to help illustrate such a unique difference of this bike. While Scott’s early carbon bikes were tube to tube construction, the FOIL has evolved to really make the most of use the advances in carbon moldings. The head, top and down tubes are created as one piece in proprietary molds, and using proprietary layups of Scott’s proprietary HMX carbon. The junction at the head-, top-, down-tube may look like a massive chunk of carbon, designed to anchor the front end, but in reality there’s a lot more – and less – to it. • still be as light as possible. The down tube uses Scott’s proprietary shaping, and from the headtube gets even wider to almost full width of the bb, where the staunch seat tube is wider than a lot others too – helping to fight those lateral forces guys like Mark Cavendish can torque up. Scott had a reputation for building stiff riding bikes at least two models before the FOIL came to life, and I concur with other reviews out there – this bike gives you all the feedback needed to race at the highest levels. Unlike some other bikes I tested, the FOIL just doesn’t need a lot of words to describe how it rides – there’s no way to interpret what they’ve done here in any other way – it is stiff. The feedback is exceptional and there’s a great connection to the tires and traction (and more importantly, knowing where the edge of that traction really is). Like most high end race equipment, loads of stiffness and feedback might not be for everyone, but the more people find themselves genuinely pushing the edge of performance / traction / handling, feedback is a big plus. For example, if you’ve ever had the chance to go really fast in a GP 2 car or an Indy ride from the last decade you would never be satisfied with anything else for all out speed and handling – but only for all out speed and handling. One thing that stood out was how all this feedback translated into the sensation of speed – everything felt fast. Cranking the pedals forward resulted in immediate and urgent movement in the desired direction – enough that I not only noticed, but noted that it would be a key part of my riding impressions in this review. Even when rocking the bike side to side while I accelerated out of the saddle, or stood while climbing seemed to propel the bike forward more quickly than other bikes I’ve ridden. I could feel every bump in the road – this is not a comfort bike, and the only thing I’ll say about vertical compliance here, is that there’s not much (that my 140lb corpo noticed anyway). This bike is made for racing and the geometry suites this ride quality. There’s no reason at all to try and tame the foil with a slack front end or longer stays or wheel base. It’s pedigree in Grand Tours and racing at the highest level is all you really need to know – if it’s good enough for a pro to ride 8 hours a day, it’s probably good enough for you too. If your prefer slightly less ‘feedback’ from your rig, try a great set of tubeless tires at lower pressures and / or a fatter section 25 tubular pumped 15 PSI or so less than you would normally run your 23′s (if you normally run your 23′s at 110 or more). A set of “training wheels” wouldn’t help a GP car, but they will surely melt the high frequency vibes and take a big chunk of the edge off the ride (and making it a snap to go “full ape” when angry riding is on order). I can’t say I noticed the reduced drag of the frameset, but when we’re talking tiny increments – like 30-40 seconds in a 40km time trial, I suspect even the most acutely aware of you will only really see a difference when your time is posted at the end of the long ride. But it is nice to know the engineering makes sense and is there to help you go faster. I’ll admit there is something comforting knowing the bike underneath you is slicing the wind better than the next guy’s, and seeing more big brands introducing their own versions of aero-shaped road bikes simply adds credibility to what Scott did two years ago.